How Much Does House Landscaping Increase Home Value? Hanging out in your gazebo on a warm summer night is one of the best feelings in the world. Allen+Roth has an amazing line of gazebos that I can personally vouch for (I own the Allen Roth gazebo with a soft-top in the color of beige, myself.) Gazebos are a place where you can hang out with all of your friends and family and just shoot the breeze. However, the winter eventually comes and that is when the gazebo top has to be put away. I always hate doing that since I know that cold, nasty weather is just around the corner! While I do take the top off of my gazebo before winter, I have a lot of friends who own a hardtop gazebo and they don’t remove their tops. 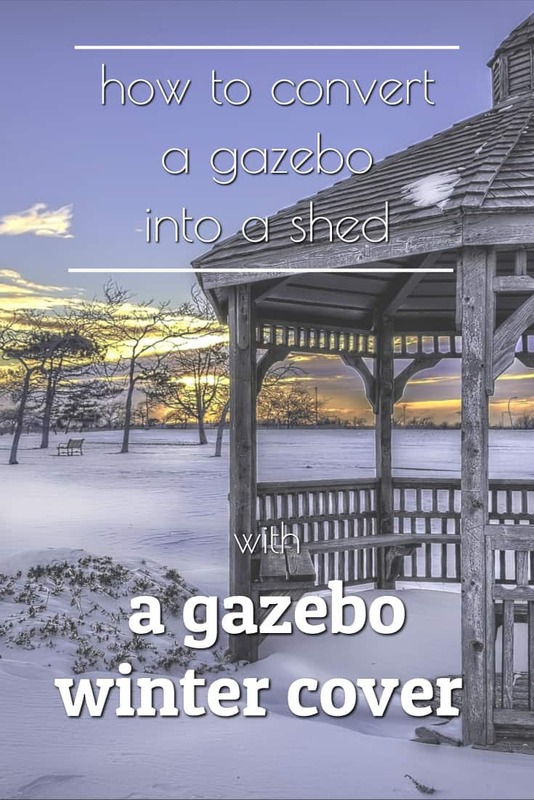 Instead, they use a gazebo cover to convert it into a winter shed. Not only your hardtop gazebo is protected during the winter but also, the cover allows you to keep using your hardtop gazebo during the winter months and have that extra outdoor space for storage or other needs. For example, if you are having an outdoor winter party, you can this improvised shed as a food and drink serving spot. If you install heaters in it, you can use it as a shelter for the guests who got too cold partying. An excellent product to use if you also have one is the Winter Cover gazebo cover from Sojag. It can protect a hardtop gazebo during cold weather. The cover is made of polyethylene and resembles a tarp that would be used for camping. The nice thing about using the winter cover is that it converts your hardtop gazebo into a place for winter storage. If you’ve wondered what to do with your gazebo during unfavorable weather, this winter cover might be your solution. Simply cover your hardtop gazebo with this gazebo cover and you’ve created a shed-like building that can double as extra storage. The advantages to using this winter cover are numerous. Besides the fact that it transforms your gazebo into a place of storage, it also protects your gazebo from harsh weather. Snowstorms and freezing rain can damage your gazebo if it is left uncovered. This is why it is such a great idea to buy this cover. It has one door and two windows. The door is placed on the 12' side of the cover. The cover is completely water resistant and comes with air vents that help to properly circulate the air. The cover also comes equipped with bands at each end which attaches the poles to the cover. Unfortunately, the winter cover comes only in one size, 10' x 12'. Get the winter cover from Amazon! Here are the most popular 10' x 12' gazebo models that fit this winter cover. The size fits pretty much all the range of popular gazebos including Allen Roth ones. Can you use the cover on a soft top gazebo? If you want to use the cover for soft top gazebos, you may do so. However, remember that the weight of snow might be too heavy for the gazebo soft top and it may collapse under it. Take your gazebo cover out of the package and unfold it. Position the cover over your gazebo and line up the longer and shorter sides with their corresponding gazebo walls. Be mindful of the door placement. Don’t install it inside out; make sure that the seams of the cover are on the inside. Acquire two stepladders and position them on two neighboring corners of the gazebo. Carefully position the cover over the gazebo. Ensure that you do not put any tears into the material. If there is any excess material leftover at the bottom of the cover, fold it outwards. Ensure that you attach the cover to the ground by placing poles or stakes through its eyelets. You will need at least two people for this installation. You will also need weights that should be purchased in addition to the cover to keep it weighted down. There are fixing bolts on the cover that keep the cover attached to the gazebo. When installing your cover, you may need to drill holes into the legs of the gazebo to accommodate these bolts. Check out a link to the original gazebo cover instructions for more details about the cover installation. And speaking of the weights… I found a product that might go well with this cover. As mentioned previously, you are going to need weights to keep your gazebo winter cover grounded. These pool cover weights from Swimline will work wonderfully with the cover. They come in a pack of 12 and are 8″ X 4″ X 36″. Polyethylene is the material used to manufacture these weights. You will need four weights for each side of the gazebo cover. The weights can be filled with any material of your choosing, including gravel, dirt or soil. Here are positive and negative aspects to these pool cover weights. Get these weights on Amazon! If you’ve been looking for a cover for your gazebo, then the winter gazebo cover by Sojag is a great choice. It would fit perfectly my Allen and Roth inspired backyard. The ability to transform your gazebo into winter storage is well worth the money spent. You definitely won’t regret buying this integral piece of outdoor decor. ​LIKE ​THIS? SHARE ON PINTEREST! Who makes Allen and Roth patio furniture? What warranty do they offer? I have the Allen + Roth 10×12 Gazebo for about 4 years and it is very sturdy, however this is my third replacement canopy top. I bought a brand new one again this year and the seams started to come apart. I sent a complaint about a month ago and never received a response. Now the one side is completely torn open. I am spending a fortune on these replacements and they don’t even last 1 season. My name is Nadya and I live in Raleigh, NC. I am a wife, a writer, and an enthusiastic designer! In my blog, I write about home and backyard design and the products that inspire me. Allenrothhq.com is a participant in the Amazon Services LLC Associates Program, an affiliate advertising program designed to provide a means for us to earn fees by linking to Amazon.com and affiliated sites.